We had the best time on our last trip to Missoula. On previous trips along the Lewis & Clark trail, we used Missoula as a base camp when exploring Traveler’s Rest, the Lolo Trail, and other places, but we never had any time to explore the town itself. Missoula has a reputation as one of the most progressive and creative towns in the West, and we found it to a great place to spend time and enjoy a little “civilization”! We poked around downtown a while and found a great place to eat lunch called the Iron Horse Pub. This was an enjoyable hangout with good sandwiches and sweet potato french fries. Then we had a wonderful time exploring the downtown shops. The shopping possibilities here are almost overwhelming! We found a great used book store called The Bird’s Nest where we each had some luck, and enjoyed poking through the shops looking at the art and jewelry and making a few purchases. 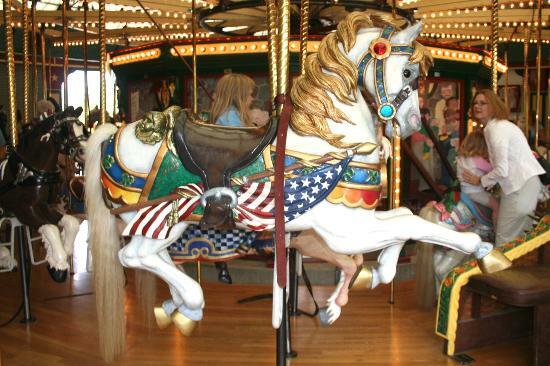 The pièce de résistance of the day was a visit to Caras Park and the beautiful, fun, and inspiring Missoula carousel! Adults as well as children are encouraged to ride the carousel in Missoula, and Mary and I each got a thrilling ride on a beautiful handcarved carousel horse to the music of the calliope. The Missoula Carousel has a really interesting history. In 1991, a Missoula cabinet maker named Chuck Kaparich approached the city with a unique offer: “If you will give it a home, and promise no one will ever take it apart, I will build a carousel for Missoula.” Kaparich already had done the groundwork to put his money where his mouth was, having purchased the antique works of an old carousel and carved four amazing ponies. The city took Kaparich up on his offer, and he began restoration of the carousel (a work of over 16,000 individual pieces). It took four years and over 100,000 hours of volunteer time, but by 1995, a real working and incredibly beautiful hand-carved carousel, complete with organ, 38 ponies, and two chariots, was up and running in a jewel-box building in Caras Park on the Missoula riverfront. The Carousel is justly a crown jewel in Missoula. A few years later, community volunteers built a spectaclar children’s playscape called Dragon Hollow right next to it. And the Carousel remains a work-in-progress. New “horses,” including a mule and a flying dragon, have been added. It just so happened that the day we played in Missoula, the rides were free, courtesy of the University of Montana. And, it happened to be Mary’s 40th birthday! 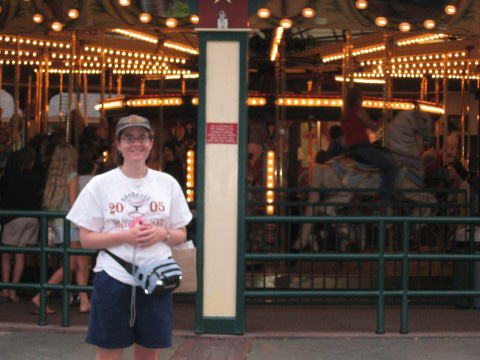 What better way to celebrate a milestone birthday than a ride on a real old-fashioned carousel? In fact, Mary’s birthday is really a big deal in Missoula, for it turned out that the city was also having a free concert in the park that evening. We stayed a while and listened to a local band, then walked across the Clark Fork river looking for a nice place to eat dinner. We found a great Italian place called Ciao Mambo, where we got yummy entrees and a dessert of “fried chocolate” — pastry balls filled with melted chocolate and topped with whipped cream! Stupendous! Strolled home along the river. It had been smoky all day from wildfires, and by this time of the evening the whole town smelled like a barbecue pit. It turned out that a huge fire had blown up northwest of town, threatening people’s homes. A sobering reminder that vacations, birthdays, and sisters are to be cherished. More great reading: Recipe for fried chocolate (called chocolate truffle ravioli here). Who says the Lewis & Clark Trail always has to involve “roughing it”? Between 1890 and 1900 my great grandfather in Wyoming who lived beside a moderately flowing creek built what he called a carousel which ran off of water power. It carried people. There would not have been many ready-made materials available to him, but he could have gone to a blacksmith and had forged needed parts. No living descendant ever saw this carousel or heard how it operated. I’m writing a historical novel and trying to give a plausible description of its construction and operation. I assume he built some kind of water turbine, but I don’t understand how he would have tapped into its power and used it to rotate the carousel. Would someone with experience in using water power please give me a workable description of how it would have worked. He also used water power to operate a churn and a washer. Again no information on it. Thanks for helping if you can.